Short walk to beach and Pier. The Studio is a private and beautifully presented Cromer hideaway. It is owned by Paul and Frances and is situated to the rear of their stylish Victorian property in a peaceful street. 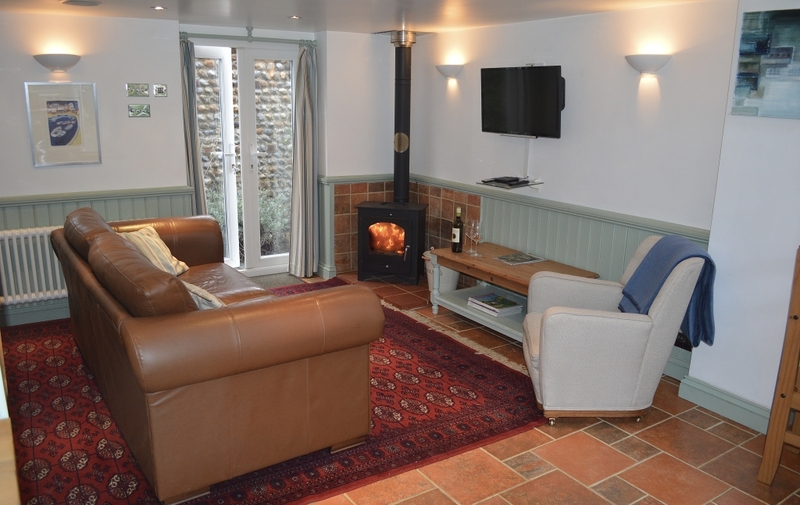 The open plan sitting room is comfortable and tasteful, with a woodburner to cosy up in front of and a well equipped kitchen, including a six ring range style cooker. Up the spiral staircase is a romantic and pretty bedroom, with quality linen and towels. Off this is an ensuite bathroom with shower and whirlpool bath. It really is a fantastic little place for two. The courtyard is sheltered and completely private, a fabulous place to relax after a hard day on the beach. The amenities of Cromer and it’s wonderful beach are just a few minutes’ walk. A perfect place for a relaxing holiday in Cromer. French door entrance to Dining area. Plus another private entrance to the rear. Open plan tasteful room. Tiled floor with rug. Kitchen: A blue painted kitchen with plenty of storage. Six ring gas range cooker with electric double oven. Microwave, toaster, fridge freezer and washer dryer. Bar stools. Sitting Room: A really comfortable and cosy area with leather sofa and throws. Wood burning stove, TV with DVD player, CD player. Sideboard with books and games. En Suite Bathroom: With separate shower, Whirlpool bath, WC and basin. Outside: A very sheltered and sunny courtyard style garden, Completely private, perfect for al fresco dining or an evening drink listening to the sea gulls! The Studio is situated in a quiet street, just a few minutes’ walk to the seafront and pier. Parking can be had on street right outside. Cromer is a traditional and elegant Victorian seaside resort, much lauded in the past which is reflected in its magnificent architecture.